Each $129 box contains 24 packs. Each pack contains 9 cards. 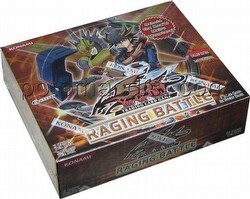 Koa'ki Meiru and Earthbound Immortal cards make their first appearance in Raging Battle. Blackwing monster cards will once again be featured adding interest for the original Blackwing cards appearing in Crimson Crisis. Plant-type cards are also plentiful, increasing the power of Black Rose Dragon from Crossroads of Chaos. Players can tune their Decks with all-new cards and Synchro Monsters including Leo's Power Tool Dragon from Raging Battle! 100-card set.